I am travelling today and then have commitments at the other end. So very little time to write. But I did read some interesting papers over the weekend which bear on the question of whether fiscal policy in the US was effective or not. The neo-liberals (mainstream macroeconomists) claim that fiscal policy is not effective. The extremists among them invoke – Ricardian Equivalence – which claims that private households and firms fear that the rising deficits will require higher tax rates and so they save more now – which means that for every dollar of new government spending there is a dollar less of private spending – so no effect. All the evidence contradicts the extreme view. There is also mounting evidence that the recent fiscal interventions have been very effective. A study I read yesterday went a step further and analysis the impact of targetting low income groups. They found that type of public spending was very expansionary. Their results support my contention that a Job Guarantee would be a very effective (and cheap) fiscal solution (as a first step) to a private spending collapse. But for all the naysayers – sorry, the evidence is mounting that fiscal policy saved the world. I have covered the topic of expenditure multipliers before. Please read my blog – Spending multipliers – for more discussion on this point. If you have trouble with symbols and a bit of algebra then you might gain by reading this blog first – What is the balanced-budget multiplier? – where I explain in simple terms how to interpret these constructs in English. The expenditure multiplier is the change in national income for a unit increase in some component of exogenous spending (government, private investment, or exports). So what is an exogenous variable as opposed to an endogenous variable? Jargon is a vehicle that every discipline uses to obfuscate and maintain authority (and in economics to largely suppress challenge) but can usually be rendered benign with some simple explanation. An economic model is just a series of algebraic statements (equations) that relate one variable to others. So, for example, we say that consumption is related to income. These models have exogenous and endogenous variables. An exogenous (pre-determined or given) variables are known in advance of “solving” the system of equations whereas endogenous variables are determined by the solution to the system of equations. We take the value of an exogenous variable as given or pre-determined. We might say that discretionary government spending (G) is equal to $100 billion which means that its value is known and not determined by the values that the other variables take or are solved to. But in a system of equations, the values of some variables are unknown and are only revealed when we “solve” the model for unknowns. These are endogenous variables. Given we know the value of x already – it is a pre-determined variable (with the value 4) and is thus exogenous. You do not know the value of y in advance and you have to solve the equations to reveal its value – so it is endogenous. It is determined by the solution to the system, which in this case is y = 2 times 4 = 8. The standard textbook model of the simple expenditure multiplier is usually derived from a simple macroeconomic model. Here is a very standard model. You can skip to the next section if you already know all of this. In macroeconomics, by definition, expenditure equals income (output). This fundamental relationship is covered in the national accounting framework. where C is final household consumption, I is private capital formation (investment), G is government spending, X is total export spending and M is total import spending. The right-hand side of the identity is total expenditure in a given period (a flow). where T is total tax revenue net of transfers (pensions etc). This is the government’s share of national income. So Y is pre-tax income and Yd is after tax income. The c is called the marginal propensity to consume (MPC) which tells you how much of every extra dollar of income received is consumed. Consumption is the determined by some fixed amount independent on income plus the MPC (c) times disposable income. The MPC lies between 0 and 1. The higher the MPC the higher is the proportion of new income generated that is consumed. So if c = 0.8 then there will be an extra 80 cents in consumption for every extra dollar of disposable income generated. Clearly the MPC = 1 – MPS. So if c = 0.8 then 20 cents in every extra dollar generated after tax is saved. While in the real world investment is likely to depend on interest rates, expected income and other variables in this simple model we assume it to be fixed in each period – that is, it is considered exogenous. While in the real world exports are depend on local and external influences in this simple model we assume them to be fixed in each period – that is, they are considered exogenous. Imports are considered proportional to total income where the proportion (m) is the marginal propensity to import. In the real world, imports will be influenced by other factors including the real exchange rate. If m = 0.20 then imports will increase imports by 20 cents for every real GDP dollar produced. Some people might consider this should be modelled in terms of disposable income so M = mYd. If imports were only confined to household consumption then this might be sensible given that the government takes its tax out of total income and households only have disposable income to spend. However, imports in the National Accounts covers the spending of households, firms and government and thus should be considered a function of total income (Y). This also impacts on how we interpret the impacts of exogenous spending through the multiplier process. So we assume government spending is fixed in each period. Tax revenue is a simple function of total income where t is the marginal (and average) tax rate. We could make the rule more complex by adding in, for example, lump-sum taxes and other taxes independent of income. So if t = 0.2 then Yd = (1 – t)Y = 0.8Y. The system of equations (1) to (8) define our macroeconomic system or model. You will note that the system reduces very quickly to the following model (because several of the variables are given in this simple model). We will also assume that C0 = 0 for further simplicity. We also know that Yd = Y – T = Y – tY, so our simple model reduces to a single equation with one unknown (Y) which will allow us to solve for Y and then subsequently we will know what C, T and M are. Note: all the exogenous variables in our model are on the right-hand side. where k = 1/(1 – c*(1-t) + m) and is the expression for the expenditure multiplier. The following discussion is summarised in the following Table. Assume that c = 0.8; m = 0.2; t = 0.15. This will give a multiplier value of approximately 1.9. It is in fact equal to 1.92307692. This means that if A changes by 1 (that is, there is an extra dollar of spending) then national income will rise by $1.92. National income would fall by $1.92 if A fell by 1. Clearly A could rise if investment and/or government spending and/or exports increased. A can increase even if private investment falls as long as government spending and/or exports rises by more than the fall in investment. You can tell a myriad of different stories about the way the government sector, the private domestic sector and the external sector is performing and how these sectors impact on aggregate demand (spending) and hence national income (GDP). We know that the balances have to sum to zero which they do (when arranged in the correct way). This relates to Period 2 in the previous Table. Assume that the government wants to increase national income because it considers that employment is too low and unemployment is too high. It can use its fiscal capacity to stimulate aggregate demand (by increasing G). If it increases G by $50 – so G now rises to $150 then what is the impact on the system? In this case A increases by 50 and is multiplied throughout the economy 1.92 times so that the total increase in national income is 769. Consumption rises to 523; Imports rise to 154; Saving rises to 131; Taxes rise to 115. 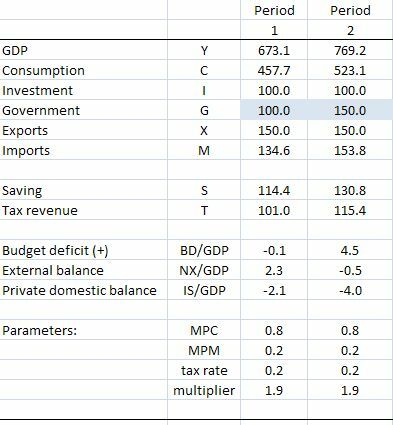 In terms of the balances, the budget is now in deficit of 35; the private domestic sector saving overall increases to 31 and net exports records a small deficit (because imports have risen with the rising income). So an expansion in government spending which pushes the budget into deficit (even though tax revenue also rises) stimulates national income and promotes increases in both consumption and saving. The results in derived here are final results and while I have related them to Period 2 the reality is that it might take several months or years before these full results are achieved. We abstract from the adjustment path in this table. The multiplier describes the adjustment path from one “equilibrium” to another. Remember the basic macroeconomic rule – aggregate demand drives output with generates incomes (via payments to the productive inputs). What is spent will generate income in that period which is available for use. The uses are further consumption; paying taxes and/or buying imports. We consider imports as a separate category (even though they reflect consumption, investment and government spending decisions) because they constitute spending which does not recycle back into the production process. They are thus considered to be “leakages” from the expenditure system. So if for every dollar produced and paid out as income, if the economy imports around 20 cents in the dollar, then only 80 cents is available within the system for private spending in subsequent periods excluding taxation considerations. However there are two other “leakages” which arise from domestic sources – saving and taxation. Take taxation first. When income is produced, the households end up with less than they are paid out in gross terms because the government levies a tax. So the income concept available for subsequent spending is called disposable income (Yd). So taxation (T) is a “leakage” from the expenditure system in the same way as imports are. Finally consider saving. Consumers make decisions to spend a proportion of their disposable income. The amount of each dollar they spent at the margin (that is, how much of every extra dollar to they consume) is determined by the marginal propensity to consume. Saving will be the residual after the spending (and tax) decisions are made. Saving (S) is thus a “leakage” from the expenditure system. Economists also define expenditure “injections” as autonomous spending which in our model comprises the sum of investment (I), government spending (G) and exports (X). The injections are seen as coming from “outside” the output-income generating process (they are exogenous or autonomous expenditure variables). For GDP (Y) to be stable injections have to equal leakages (this can be converted into growth terms to the same effect). The national accounting statements that we have discussed previous such that the government deficit (surplus) equals $-for-$ the non-government surplus (deficit) and those that decompose the non-government sector in the external and private domestic sectors are derived from these relationships. National income is in equilibrium (that is, will not change) once the leakages equal the injections. Income changes bring that equality into force because the leakages are sensitive to income changes. So imagine there is a certain level of income being produced – its value is immaterial. Imagine that the central bank sees no inflation risk and so interest rates are stable as are exchange rates (these simplifications are to to eliminate unnecessary complexity). The question then is: what would happen if government increased spending by $50? This is the terrain of the expenditure multiplier. If aggregate demand increases drive higher output and income increases then the question is by how much? The multiplier works as an adjustment process. Firms initially react to the $50 order from government at the beginning of the process of change. They increase output (assuming no change in inventories) and generate an extra $50 in income as a consequence – so Y increases initially by the full injection of new government spending ($50). There is a saying that one person’s income is another person’s expenditure and so the more the latter spends the more the former will receive and spend in turn – repeating the process. So the initial rise in income stimulates further consumption which is called induced consumption because it is induced by an initial increase in exogenous spending. This consumption then leads to more output and subsequent spending. At each point in the adjustment process tax revenue, import spending, saving is rising as income rises. And so the process continues with each period seeing a smaller and smaller induced spending effect (via consumption) because the leakages are draining the spending that gets recycled into increased production. Eventually the process stops and income reaches its new “equilibrium” level in response to the step-increase of $50 in government spending. At that point the leakages will have risen in total (accumulated over the period of adjustment) to match the initial 50 injection in government spending. The new national income is $769 a rise of $96 after the government increased its spending by $50. The extra $46 in income came about by the successive induced consumption increases as the multiplier played out. Please read my blog – Spending multipliers – for more discussion on this point. In February 2011, the Congressional Budget Office (CBO) put out their latest publication which pertains to the effectiveness of the fiscal stimulus – Estimated Impact of the American Recovery and Reinvestment Act on Employment and Economic Output from October 2010 Through December 2010. … funded more than 580,000 full-time-equivalent (FTE) jobs. Reporting error (bias difficult to estimate). CBO says that “some of the jobs included in the reports might have existed even without the stimulus package” (so an over-estimate bias). CBO says that “the reports cover employers that received ARRA funding directly” including the immediate subcontractors but exclude “lower-level subcontractors (so an under-estimate bias). CBO says “the reports do not attempt to measure the number of jobs that were created or retained indirectly as a result of recipients’ increased income, and the increased income of their employees, which could boost demand for other products and services as they spent their paychecks.” Thus, the estimates exclude the induced consumption effects that drive the expenditure multiplier (so an under-estimate bias). CBO says “the reports do not measure the effects of other provisions of the stimulus package, such as tax cuts and transfer payments (including unemployment insurance payments) to individual people” (so an under-estimate bias). – Increased the number of full-time-equivalent jobs by 1.8 million to 5.0 million compared with what would have occurred otherwise, as shown in Table 1. The following graphic reproduces Table 1 in the CBO report. 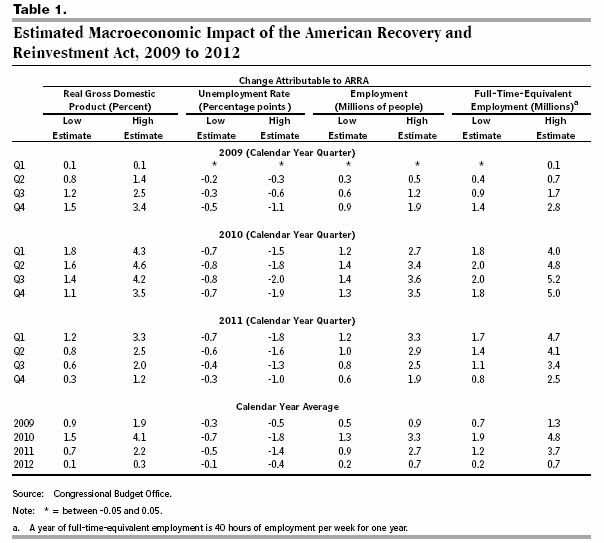 The effects of ARRA on output peaked in the first half of 2010 and are now diminishing, CBO estimates. The effects of ARRA on employment and unemployment are estimated to lag slightly behind the effects on output; CBO estimates that they began to wane in the fourth quarter. 1. The impact of the fiscal stimulus was positive. 2. The impact is now approaching zero and unless there is a surge in private spending the US economy will stagnate and there will be no significant reduction in the unemployment situation over the coming 12 months. To put the impacts estimated in Table 1 into context I created the following graphs which show the simulated unemployment rate (without the ARRA stimulus) and the actual unemployment rate (with the stimulus) from 2006 onwards. The simple expenditure multiplier model is an aggregate result and suppresses a detailed knowledge of income distribution. The question that arises is whether the effectiveness of fiscal policy varies according to where the spending occurs. The point is that the MPC is an aggregate figure. It is clear that different income cohorts have different MPCs. High income earners tend to have lower MPC than low income earners. Logically, if the government targets spending among households with a high MPCs then the induced consumption effect should be higher than if it gives an extra dollar to high income earners. So if fiscal policy deliberately invoked what has been referred in the literature as the “Keynes-Dusenberry” demand policy – that is, a redistribution of income to low income earners which higher MPCs, then the overal expansion will be larger. This level of complexity is usually ignored in introductory macroeconomics courses. A recent study (published February 2011) – Did the Stimulus Stimulate? Real Time Estimates of the Effects of the American Recovery and Reinvestment Act – by economists James Feyrer and Bruce Sacerdote provides some excellent evidence to explore this complexity a little further. The paper is an NBER Working Paper (No. 16759) and you can only access it if your library has a subscription to the NBER. Sorry I cannot make it public but I will summarise their results. To overcome the problem of “the lack of a counterfactual” – that, is it is impossible to “know what the path of the economy would have been in the absence of the stimulus” economists fall back onto macroeconomic simulations and compare what would have happened with the policy change as against what actually happened. … the effects of the fiscal stimulus alone appear very substantial, raising 2010 real GDP by about 3.4%, holding the unemployment rate about 1½ percentage points lower, and adding almost 2.7 million jobs to U.S. payrolls. Feyrer and Sacerdote say that “(u)nsurprisingly, the models tell the same story today that they did when arguments for and against the stimulus were being made. … disaggregate the spending by federal agency. In examining the spending patterns we found that the agencies fell naturally into three hroups. The first group includes agencies providing block grants to fund local government employment. A large proportion of spending by the Departments of Education and Justice were used to fund teachers and police at the local level. The second group consists of support to low income families. Spending by the Departments of Agriculture, Health Education and Welfare, and Housing and Urban Development had a large component of support to low income individuals (food stamps, Medicaid, and rental assistance). The spending of the third group largely consisted of paying for new infrastructure projects. This group includes the Departments of Transportation and Energy which funded building projects. The results for each of the individual agencies within a group are very similar. The importance of that disaggregation is that it allows us to get some insight into the differential impacts arising from targetting cohorts within the income distribution. I will not go into the econometric techniques they used to generate their results. We could quibble about this and that but they are largely standard methods that I would also use, although perhaps with nuances. The following table is taken from their study and summarises the stimulus impact and the implied multipliers by area of spending. The overall results mask significant heterogeneity by type of spending. Transfers to local governments and school districts to support teachers and police appear to have no positive effect on employment. Programs funding support for low income households generate the largest employment response. Building projects generate a smaller, but still substantial response. Excluding the transfers to local schools and governments, the cost of a job in the stimulus was less than $100,000 per year. Including the transfers to local school districts, this cost increases by at least a factor of two. 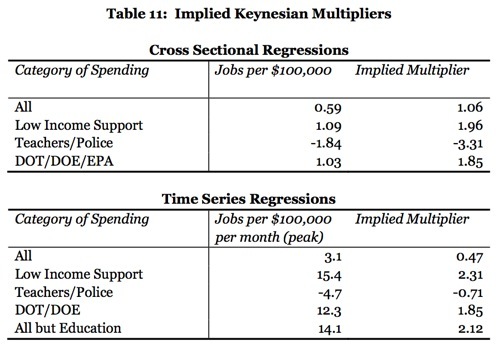 The implied Keynesian multipliers are between 0.5 and 1.0 in the aggregate and rise to 2.0 if one excludes education spending. In other words, “support programs for low income households and infrastructure spending are found to be highly expansionary. Estimates excluding education spending suggest fiscal policy multipliers of about 2.0 with per job cost of under $100,000”. That negates everything the deficit terrorists have said about the effectiveness of the stimulus. As regular readers will know I advocate the use of a Job Guarantee which would provide minimum wage public sector jobs to anyone willing to work and who was unable to find a job elsewhere. Typically, the Job Guarantee workers would be among the most disadvantaged workers in the economy and likely to have higher MPCs (given their history if low income). The results of the study discussed today would reinforce the claims I make about the effectiveness of a Job Guarantee. The multiplier effects which include spill-over job creation in the private sector from the extra spending by Job Guarantee workers would be substantial. In Australia we estimated that of the total jobs created if the government introduced a Job Guarantee around 20 per cent would be non-Job Guarantee jobs in the private sector as a result of the multiplier effects. Very substantial. The evidence from the US outlined in this study is consistent with those results. So all you Austrian School idiots and neo-liberal mainstreamers – there is on-going evidence that the US fiscal stimulus worked. The same conclusion can be drawn in other countries by consulting the evidence. It is clear that the scale of the fiscal intervention was inadequate and not targetted properly. It should have been much larger and targetted to low income earners. The introduction of a Job Guarantee would have been the first thing the US government decided. It would have held the unemployment rate down to low levels and more quickly kick started the private sector. The jobs per bucks would have been substantial relative to what has actually happened. But there can be no doubt – fiscal policy is effective – and monetary policy is not! Bill, I don’t attach quite as much importance to the multiplier as I think you do. The multiplier for different types of spending is obviously an important technical detail that needs to be calculated. But I’m very wary of claims that one type of spending is better than another because the multiplier is larger for the first than the second. Reasons are thus. If the spending concerned is new money, the creation of that money is costless in real terms. Thus criteria like “jobs created per $1,000 of spending” are irrelevant. Or should I say “the REALITY is that they are irrelevant”. Obviously when trying to wheedle money out of Treasury based deficit terrorists, then the multiplier is a selling point. In reality, the only IMPORTANT criterion is the REAL output from different types of employment. Indeed, that is very much what economics is all about: maximising output per hour, within environmental constraints. In contrast to new money, suppose the money comes from $X of tax, and that Y jobs are destroyed by the collection of that tax. There is no merit in making sure the multiplier is sufficiently large that Y or more jobs are created when the $X is spent. It may be that MORE than Y jobs are created. But what of it? That may lead to inflation exacerbating labour shortages, in which case the number of jobs created would just have to be limited to Y or thereabouts. Alternatively the labour market might have plenty of spare capacity left after creation of the Y new jobs. In which case stimulus (e.g. creation of new money) would be called for, and that, to repeat costs nothing. CONCLUSION: The multiplier is not a basis for deciding which jobs to create. The only relevant criterion is the REAL output from different types of employment. I have learned a lot about economics since I started reading this blog and I’m thankful to Professor Mitchel for his hard work. But, the problem is that people like the governor of Wisconsin neither know nor care about economics. In my opinion, their only objective is to appease their corporate masters and they are willing to steal and lie to do it. In fact economic ignorance may be in their favor as they may certainly believe the neo-liberal agenda set forth by their masters, and thus will be more effective in persuading others. As I see it, the real problem here is the belief, held both by religion and science, in the survival of the fittest. We see this belief everywhere in the world. A prime example is the “reality” shows on television where anything and everything goes. Usually the biggest lier and crook is the winner. Unfortunately, that same “reality” is being played on the world stage and will continue until the basic belief in survival of the fittest is changed to a belief in co-operation. Then, people like Mr. Mitchel may make inroads into mainstream economics. Maybe that belief is beginning to take hold in the middle east. If so, then a lot of lying, or diluted, politicians may lose their jobs over the coming years and real change may take place as opposed to campaign promises of “change we can believe in”. I’ve been really struck by how untrue that actually is in the UK. In the UK, reality TV voters come down very harshly on any sign of two-facedness or manipulation. Being basic, transparent and straightfoward is definitely the way to win a UK reality TV show. I’ve much pondered how money has an extraordinary capacity to subvert our society into being one that rewards the very traits that reality TV shows demonstrate are still -despite everything- so widely reviled. In which case you wouldn’t have a deficit, so you wouldn’t be doing that. A lot of your arguments recently have been ‘what if we haven’t got a deficit’. Surely at that point MMT argues that you have to have wound back any stimulus to zero and all that is left is non-discretionary public spending that has to be paid for by taxes. The base assumption in Bill and all MMT discussions is that there is deficient demand. Are there any papers anywhere that assess the accuracy of these multipliers – as you would with weather forecasts – to see whether they are accurate in their predictions? It seems strange to me that we can model the weather fairly accurately, but not economic stimulus. Obviously the politics is more important than the accuracy. Neil, I agree that collecting $X in tax and spending $X is a strange way of trying to create jobs, but some multiplier enthusiast might advocate it on the grounds that they’ve found a WAY of spending the $X that involves an unusually large multiplier. Thus a net increase in employment would allegedly result. My answer to such an idea is “nonsense”, and for reasons given above. A more common scenario is where a Keynsian “borrow and spend” policy is advocated. And those advocating the policy admit that crowding out destroys a given number of jobs. They thus scratch around for a way of spending the money that involves a multiplier sufficiently large to create more jobs than the crowding out destroys. Here again, I think the multiplier is irrelevant: the only important question is the effect of different policies on real output. In fact concentrating on real output amounts to aiming at Pareto efficiency sort of. For example, if policy A results higher GDP but fewer jobs than policy B, I suggest going for policy A, because some of the additional GDP can be redistributed to the unemployed: everyone is better off – those in work and those out of work. You don’t live in the U. S., do you? That kind of policy has never resulted in such redistribution here. Look at the shameless way that the Republicans attacked extending unemployment benefits last August, and the fact that doing so did not prevent them from enjoying a landslide victory in the polls in November. -I guess I’m such a multiplier enthusiast but I’m keen to hear any explanation as to why that’s stupid. Doesn’t Bill’s explanation that lower income groups have a greater propensity to spend make perfect sense? Personally I suspect that the situation is even more dramatic than Bill makes out. When high income groups do spend it is more likely that they spend on things that create no jobs (eg collectables, land etc). Low income groups spend on services and consumables that create lots of jobs. Policies that lead to spending on land (such as Thatcher’s mortgage tax relief etc) do boost GDP but don’t create any real goods or services. If as you say such policies enable the gov to make bigger unemployment benefit pay outs, then the real goods and services that the nation gains are parasitically at the expense of the rest of the world. How do you know your “C + I + G + (X – M)” are in the same time period as your measured Y? Are you describing a multiplier or the velocity of the newly created medium of exchange? Stone: I’m glad to hear that the British value integrity more than we apparently do. I hope such values will soon spread throughout the world, and especially to the political class which shows no hint that such ideas exist. Maybe then politicians will remember the Constitution and begin to live by it. GLH, sadly Brits who vote for reality TV probably predominantly don’t vote in political elections. As politics becomes more corrupt and self serving, decent people seem to just withdraw from the process and so it gets worse. I sometimes wonder whether people who’s chief ethos is to not impose their views on others are both those least likely to be involved in politics (almost by definition) and most likely to have views conducive to general well-being.